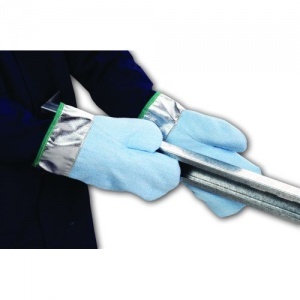 The Polyco Ingot Heatbeater Glass Mitten Safety Gloves are modified glass mittens with aluminised glass fabric cuff. 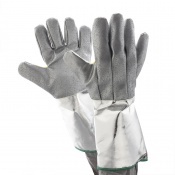 The Polyco Ingot heatbeater Glass Mitten Safety Gloves provide exceptional protection against heat and can withstand and protect from contact temperatures of 500°C for 40 seconds. The Kevlar felt liner provides the wearer with exceptional comfort. 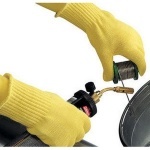 The Polyco Ingot Heatbeater Glass Mitten Safety Gloves are available in two lengths for when extra forearm protection is needed. This glove is commonly used in engineering and manufacture including glass industries. The Materials - The Polyco Ingot Heatbeater Glass Mitten Safety Gloves are engineered and made with aluminised glass fabric cuff and a Kevlar felt liner provides the wearer with exceptional comfort. Grip and Dexterity - Due to the nature of the glove and its designed usage the level of grip and dexterity is low. Contact Temperature Time - 500°C for 40 seconds. This product is suitable for a universal palm size but varies in length, the measurements are below.